It could be I am just out of coding shape or there is more to this reshaping of the ds106 Assignment Bank than it seems. I’d hedge money on the former, but not for ling. Nothing is pretty yet, but the boxes each represent a “term” or something like a category within the taxonomy of Assignment Types- this means, you can create your own list of categories for assignments like making categories in wordpress posts, and the front page will automatically update to reflect these. Ultimately you will be able to create / upload icons, and the theme will have options to have it sort by name, order added, and.or maybe the number of items within each one. I am thunking you will be able to define upfront what you want to call these “Things to Do” – “Assignments” or “Challenges” or “Tasks” or “Fish Heads”. Once formatted and filled out with the other parts of information, it will do pretty much what you find on this kind of page at ds106. Ok, there is not much there. But its important to work out a framework that will be flexible, trying to envision situations I am not expecting. which always gets the parent theme directory in a parent-child relationship. The responsive Bootstrap theme will mean the content should flex itself to fill whatever screen size is there. I am planning to put any widgets in the footer and kill the sidebar ones. If this is done correctly, it can still be in a blog that has its own blog posts (can be used for news, etc, commentary). If there are things you are hoping to see in this kind if site, now is a good time to lay down your requests. 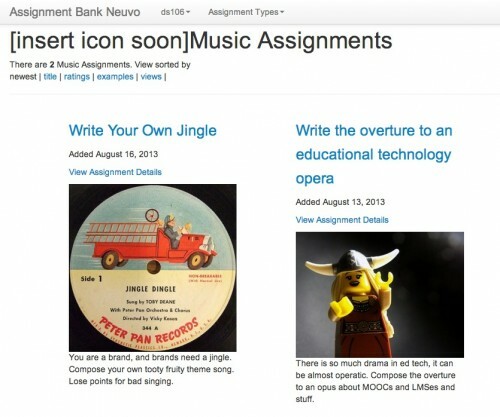 Thank you for the work you are doing on the assignment bank. As you probably know, I am working on getting ideas for language teachers using the ds106 model…would be lovely to collaborate, commiserate, whatever. For the moment I am just using good ole google forms.